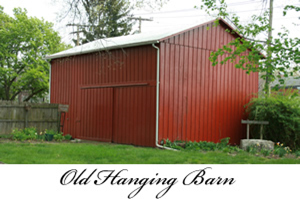 Guided tours of the Old Jail & Hanging Barn are available during normal business hours. No appointment necessary. Cost is $5.00 per person. 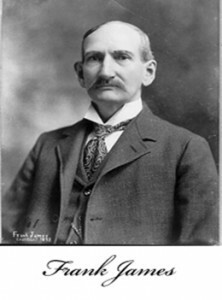 The most famous of the many prisoners associated with the Jail was Frank James, brother of Jesse. On April 24th, 1884, James was brought to the Cooper County Jail by Sheriff John Rogers to answer a warrant for his arrest for a train robbery that took place in 1876. Sympathetic citizens of Boonville raised his bond in a matter of hours. The case was later dismissed for lack of evidence.In 1871, the County Court also authorized the construction of an adjoining sheriff’s residence consisting of three rooms. In a matter of months, it was expanded to include a second story as well as a kitchen addition to the back of the main floor. Numerous other improvements were made including a brick privy, a cistern and a smoke house but none of these out buildings survived. The last major construction occurred in 1878 with the building of the “stable/jail barn” designed to house the horses of the sheriff in case a posse was needed. It was in this building that one of the last public hangings in Missouri took place. On January 31st, 1930, Lawrence Mabry, 19, climbed the 13 steps to the loft and was “hung by the neck until dead” for a robbery and killing in Pettis County. This hanging was a contributing factor in the elimination of the county capitol punishment. 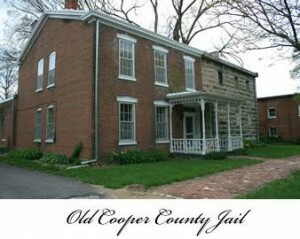 In 1971, the Jail Barn became the first restoration project of the newly created Friends of Historic Boonville. Every cell has its own history, its own stories to tell. The graffiti-carved limestone rock walls stand as silent witnesses to a way of life beyond our comprehension. The cells are empty now. But with a little imagination, you can hear the footsteps of the sheriff as he walks across the floor to one of the cell doors. The huge jailer’s keys clang against each other. There is a pause and then the sound of a brass key entering one of the old iron locks. For some, it turns to the right, opening the door and letting them out, giving them a second chance. For others, the key turns to the left, closing the door behind them, sealing their fate.